The Scheme of National Award to Teachers was started in the year 1958-59 with the object of raising the prestige of teachers and giving public recognition to the meritorious services of outstanding teachers working in Primary, Middle and Higher Secondary Schools. In 1967-68 the scope of the scheme was enlarged to cover the teachers of Sanskrit Pathshalas, Tolls etc. run on traditional lines. In 1976 the scheme was further enlarged to cover Arabic/Persian teachers of Madrasas. From the award year 1993, the scheme has further been enlarged to cover teachers from Sainik Schools, Navodaya Vidyalayas and schools run by Atomic Energy Education Society. Earlier CBSE had been allocated a quota of 10 awards – 2 for each zone subject to availability in case of shortfall of recommendation from the entitled States/UTs and organizations. Each award carries with it a certificate of merit, a cash award money of Rs.50,000/- and a Silver Medal. The enhanced amount will be given to the National Awardee from the Award year, 2014. (I) 355 Awards States/UTs, Kendriya Vidyalayas, Navodaya Vidyalayas, Atomic Energy Education Society, Sainik Schools, Sanskrit And Arabic/Persian teachers. (II) 6 Awards Teachers of Council for Indian Schools Certificate Examination (CISCE) affiliated schools. (III) 20Awards Teachers of Central Board of Secondary Education (CBSE) affiliated schools. The National Awards belonging to CBSE would comprise of awards to 2 teachers each for Northern, Southern, Eastern, Western and North-Eastern, Delhi Zones and 2 Slots for the teachers of independent affiliated schools situated abroad. The teachers recommended by CBSE should be other than those who have already been covered under the allocated quota for States/UTs/ Organizations. (IV) 43 Awards Teachers promoting Integrated Inclusive Education (IE) in Schools. These “Special” awards would be given to teachers who promote the education of children with disabilities in regular schools run by States/UTs and other schools system. Such awards would be given to the following categories of teachers. Classroom teachers with at least 15 years regular teaching experience and Headmasters with 20 years of regular teaching experience and who are actually working as teachers/headmasters in recognized primary/middle/high/ higher secondary schools only shall be considered. Teachers who are teaching up to class VIII should be considered in the category of Primary School Teachers and those teaching classes IX-XII, in the category of Secondary School Teachers. For teachers promoting Integrated Inclusive Education the eligibility will stand reduced from 15 years of classroom teaching experience to 10 years of service and from 20 years for Headmasters to 15 years if they are to be considered for awards in respect of Inclusive Education. 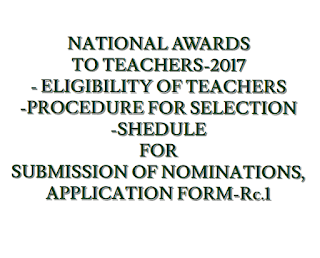 Normally retired teachers are not eligible for the award but those teachers who have served a part of the calendar year (at least for four months i.e. up to 30th April in the year to which National Award relates) may be considered if they fulfill all other conditions. The service rendered on re-employment after attaining the age of superannuation will not count as eligible service. Teachers whose names were recommended last year or before can be considered again if they are still otherwise eligible and are recommended by the State Government/ Union Territories. His/her academic efficiency and desire for its improvement. His/her involvement in the social life of the community. The State/UTs/School systems shall recommend at least the prescribed number of awards under the category “Special Awards”. 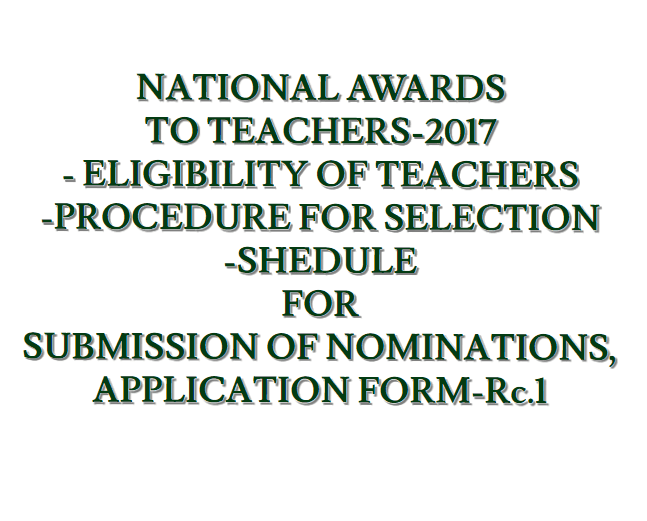 In case they do not find suitable number of teachers under this category, the award will not be recommended, but in that situation the number of allocated awards for special award shall not be transferred to the general category. The final selection will be made by the Union Government.